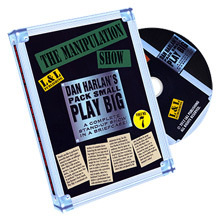 The Manipulation Show that you'll see on this volume demonstrates how a performer can create the feel of a large stage production and yet fit everything that's needed for the show in a small briefcase. Though the central theme is material for a semi-silent stage manipulation act, there's a wide variety of plots and methods in play that will interest magicians of all types. The show begins with Dan performing the Dancing Cane where a walking stick takes on a life of its own, floating in the air and moving, apparently, of its own volition. For the stunning climax, the cane changes color and then instantly becomes two silk handkerchiefs.